It would be good to have an option or setting the most top of results to be chosen by default. Do you check it on version 0.6.1 whether built a plugin from source (branch https://github.com/jenkinsci/git-parameter-plugin/tree/feature/JENKINS-31939)? 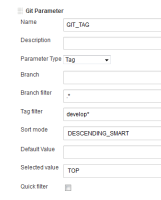 Boguslaw Klimas added a comment - 2016-07-26 14:19 - edited Do you check it on version 0.6.1 whether built a plugin from source (branch https://github.com/jenkinsci/git-parameter-plugin/tree/feature/JENKINS-31939)? It does not work from you because these changes have not yet been merged. I made only pull request, so you can see whether such a change is right for you. At version 0.6.1 will not work, as you want. If you want to use it you must wait to release 0.6.2 or compile plugin from source. Boguslaw Klimas added a comment - 2016-07-27 08:00 It does not work from you because these changes have not yet been merged. I made only pull request, so you can see whether such a change is right for you. At version 0.6.1 will not work, as you want. If you want to use it you must wait to release 0.6.2 or compile plugin from source.